This weekend I was out all day Saturday at Kyle’s Cricket and then a nephew’s daughter’s 1st birthday party and upon return home had my niece and her kids come over, so I did not get to do anything Shed related on Saturday. Today was a little different. I spent about 2 hours in the shed earlier today before the V8’s and then about 30 minutes following the V8’s from the Gold Coast on TV. While in the shed, I installed some tooth brush bristles on track 1 in Clapham Yard. This is to ensure that when the last three wagons of trains # 1 and #17 are drop off, their last three wagons do not end back up at Acacia Ridge Yard by rolling away down the large slope. The tooth brush bristles are very soft, and just touching the axles on the bogies and apply just enough friction to prevent the wagons from rolling away. I have above 7 sets of them at various places where the last three wagons will be placed at the Acacia Ridge end of the track number 1. 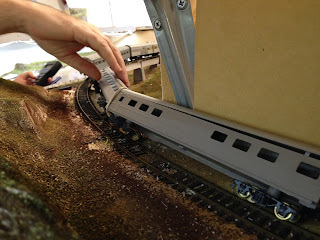 I also soldered a wire on track 1 at Loco Pilly which prevented the power getting through to the siding when locos or my CPH railmotor lay over in that track. I also re-attached a wire to the relay that throws the power to the frog of the point that directs trains either into Loco Pilly or through on the mainline to Clapham Yard when coming down the include from Dutton Park. I then spent some time pinning down a number of manually operated points that the operators at the last operating session complained about. These points moved when they were changed. So hopefully they are all fixed now. I also spent some time contemplating how to enhance the look of Lismore. I decided to thrown a few trees around at that location. I had a couple of palm trees in the cupboard which got installed, and then I installed quite a dead trees courtesy of my garden and the Lemon Scented Tea Tree I have. I find that these branch ends look like small saplings. I also dove into my collection of various twisted wire trees that I still have available. I really need to get around to adding the various fences in Lismore that will protect this site from wandering people. But I just do not know what sorts of fences to make. I could do about 5 different types. So maybe next week or soon after I might make a small test section about 100mm long of each of the types of fencing that I am considering installing. Later this afternoon, I went down to the shed and started drawing some plans for the frame I will need to make in order to install the LED lights above Cougal Spiral. I have since also drawn a basic scale diagram to assist with the various shapes of wood I will need to make it out of. I am also thinking about another string of LED’s being installed above Clapham Yard and heading back towards Acacia Ridge Yard. I will see if I can get the required hardware next weekend. Saturday afternoon, being the third Saturday of the month, was spent at Anthony’s operating trains at his monthly operating session with Shelton, Brendan and of course Anthony himself. It was another great session. Anthony’s trains just run so well. The company is great, the environment is very conducive to transporting yourself into the Border District in the 1970’s. 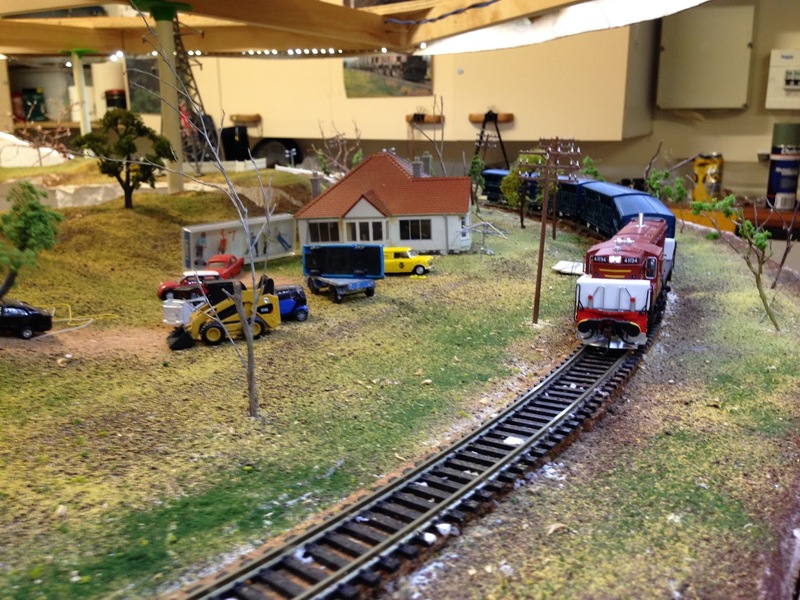 A few changes were made to the layout – particularly to the staging tracks and are a great step forward. The changes were well received by the crew. This layout is certainly a well through out layout and is just absolutely great to operate on. 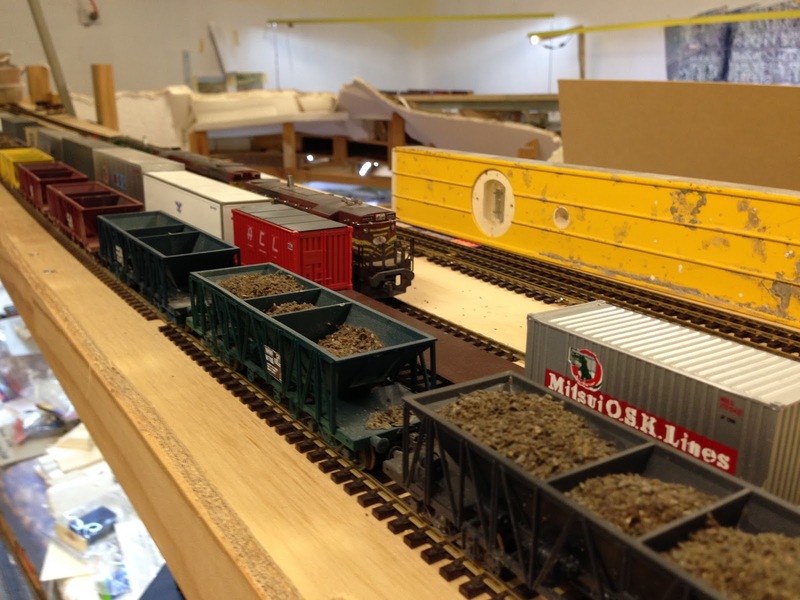 The time that goes into setting up the wagons before each session, changing the wagons cars to their next destination ensure that they are in the correct train order must be immense. Anthony needs to remove trains from the layout before the next operating session, and add new ones. This is a different concept to mine, where I try and incorporate all the movements to set up the layout for the next session into the end of the last session. This morning I went over to Shelton’s place to assist with some ideas generation and conceptual design for a redesigned Western Victoria layout. Shelton drove me to and from Anthony’s yesterday and we were talking about his layout. So I volunteered to spend some time helping him brain storm. I think we spent almost two and a half hours, drawing designs, measuring, discussing, changing, and improving on our initial concepts. I think Shelton will probably update everyone over the next few weeks as his concept designs are further teased out. During the week, I spent many hours redesk checking the changes to the timetable that I discussed about last week. I added the timetable cards to the timetable graph to see if they fitted in between the other already existing trains. I also added 10 narrow gauge trains to the graph. However, on Friday I came to the conclusion that I have the narrow gauge trains running in the wrong directions. Basically 3 of the movements are runs from Acacia Ridge Narrow Gauge Yard to Fisherman Islands Narrow Gauge Yard and three trains run back in the other directions. Sometime eventually after I win lotto, I hope to purchase a narrow gauge empire consisting of one coal train (8/9 wagons), one wheat train (8/9 wagons) and one shunt with a mixture of container wagons, louvres and tautliners. I will need a few more wagons for the other four trains that run from Acacia Ridge narrow Gauge Yard to Clapham Yard and return. I will need at least three narrow gauge locos. I think it will take about 5 or 6 years to amass this collection given my budget constraints. Anyway, I have come to the conclusion, that I will reverse every one of the just created narrow gauge trains in the timetable. So the train paths that went from Acacia Ridge to Fisherman Island will now run in the opposite direction. The paths that ran from Fisherman Islands to Acacia Ridge will now also run in the reverse direction. I just think it makes more sense especially with making use of the various sidings and the shunts trains. It is quite obvious when you look at the timetable graph. On Friday I also soldered a wire that had come off a control panel at Murwillumbah. So this afternoon I went down to the shed and test ran the newly changed standard gauge trains involved in shunting Clapham Yard and all the shunting moves associated with the wagons coming off at Clapham Yard and running via Park Road to South Brisbane. I have added 3 more 80’ container wagons to the roster and also added 6 other wagons to the Park Road to South Brisbane Shunt. These wagons were just sitting around South Brisbane taking up a siding. Now they will sit in Park Road and take up a siding and move back and forth to South Brisbane. This arvo's session was not without incident. No sooner had I started running No.1 Container out of Grafton when it was involved in a level crossing accident at Baker’s Farm level crossing. The car rolled down the road and stalled just as the train came through. Later on there was a further issue when going through Running Creek when a bogie screw came off. A breakaway the train occurred in the Running Creek section. When the loco crew walked back to investigate, they were confronted by this! A bogie screw had fallen off and this was the result. Anyway still further on the loco from No. 2 Container came to grief at Border Loop, when it found the missing bogie screw from the earlier incident. While running the various trains, I have made myself a list of about 4 items to fix over the coming weeks. I spent considerable time under the layout, fixing up two manual point throws - triggered by a Dublo lever switch. These levers had become inoperable over the last few running sessions and as I was running trains past today, I took the opportunity to fix these small issues up. I also replaced a few KD clone couplings with genuine KDs on a few wagons. I reglued (superglued) a few KD’s to some wagons where they keep on coming adrift. I cleaned the wheels on about 10 container wagons. I gave them a good descale. I also cleaned the wheels on at least 3 locos to improve their operating reliability. I also added KD washers to a few bogies on some freight wagons and this seems to have made these trains more reliable. Just now as I was writing this blog, I had a thought that I could extend another two shunts to Acacia Ridge Yard as this now has a huge number of spare wagons just laying around in it. I’m sure there will be paths available. 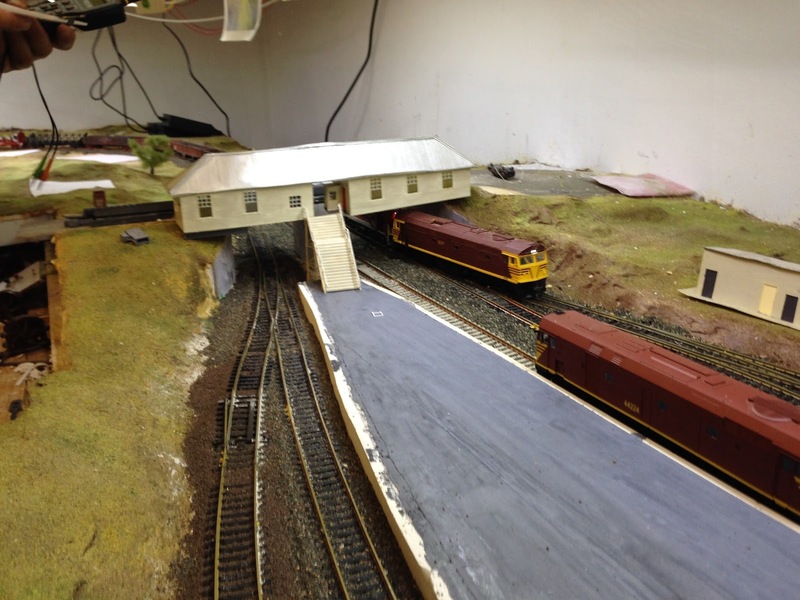 I will also get to use the series of cross over points that I had previously added to Acacia Ridge Yard. So this week after reversing the narrow gauge trains in the graph and updating the timetable cards following today's test run improvements (mostly textual descriptions on the timetable cards), I will look at the extra standard gauge shunts to/from Acacia Ridge. I will also start crossing off the items that were added to today’s to do list. With two guys calling in sick, I ended up with 7 visitors, plus myself for the Running Session held last Monday. However one of the guys in attendance just observed and did not run any trains even though we tried to coerce him – well it was his first visit to see the layout running. We also had another first timer – Iain, However, Iain is a regular timetable runner at Anthony’s place and at many other layouts particularly down in South Australia. Yes - he is one of those modellers. Two trains are crossing at Cassino. The southbound train in in the main platform while a north bound train is heading into the yard. We ran about 34 trains and completed this in under 2 hours. Way sooner than I had thought possible. Basically the session was divided into two session, The first with Arthur as North Coast Control and the second with me taking over the reigns. Well there were issues. There was a large incident where the Brisbane Limited (NL1) driven by Anthony fell off Cougal Spiral after the motorail wagon had an issue and caused it to pull inwards around the spiral. The headlines read that 200 people died. Just in front of this train was the 620/720 on a Histerical society tour. Apparently the driver jumped ship as his train was entering Kyogle to run back and take photos of the incident developing behind him and left his out of control 620/720 to continue careering down the track straight through the platform at Kyogle and continuing out the track onto the main line without the staff for the section and if I recall correctly there was a train coming the other way into Fairy Hill Loop. Luckily an alert passenger hit the emergency stop button causing the rail motor to come to a stop and this heroic action saved the day for the passengers and thus another 100 people being killed with a head on crash around Fairy Hill Loop. Now it begs to understand how on earth there seems to have been two trains within the Border Loop to Kyogle section in the first place. The railway management might have to call the drivers Anthony and Shelton before a board of enquiry to uncover the truth about this incident. The hand of God seen here fixing up some of the wagons that derailed - supposedly killing 200 people. There where two other major incidents. In one the last wagon on a container train was left behind somehow back in Glenapp Loop unbeknown to the driver and North Coast Control. There was another incident where the last stock wagon on short stock train heading to the Kyogle Stock Siding, lost a wagon somewhere around Fairy Hill. On this instance, the following train was able to stop clear of the obstruction and also add it to the end of his train and take the wagon to Cassino for safe working. It would probably be no surprise that both these incidents were from one of the drivers mentioned above. So I'm not mentioning any names of the guilty - it was not Anthony. 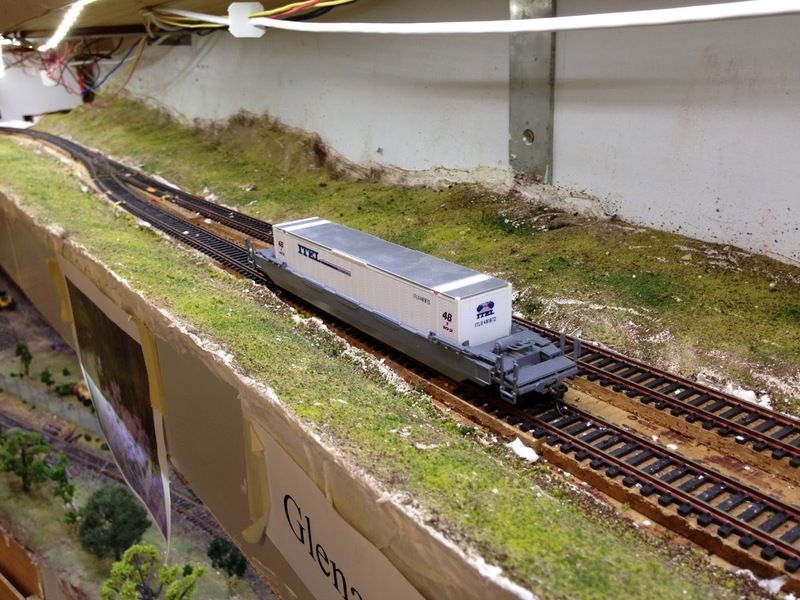 The container wagon found languishing in the loop at Glenapp Loop. The northbound (down) stock train heading past Ron and Margaret's B&B near Fairy Hill Loop. The stock train has made it (well most of it has) to Fairy Hill Loop. The stock train being positioned into the siding to allow subsequent loading. So while there were plenty of issues, and it seems most issues followed poor Shelton around, most were very quickly resolved and the trains were running all over the place and completing their runs quite successfully. Occasionally there were trains put away as the congestion in certain parts of the network forced two up trains and one down train to run past a location in quick succession and there was already a train at that location, e.g. the Up Ballast Tamper. Poor Paul was on the Tamper locked away for what probably seemed like an eternity waiting for the conjestion to ease. I had about 7 changes to be made to the timetable cards, some pretty simple – changing the number of wagons to be dropped off/picked up at one location, changing the tracks that two trains enter into in a crossing loop, adding more information into the text on a couple of cards so make it clearer for the drivers to know what they have to do. So nothing too difficult. This has been completed. 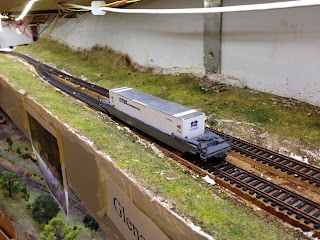 There were some issues documented with a few wagons, and I have already swapped out some KD clones for real KD couplers, and fixed up skidded wheels on one wagon. I also need to check out some of the newly ballast track in Lismore with reports of numerous derailments at the location. One driver also found two nails in the track that I missed. I added the nails to hold the track down while I ballasted over the previous few weeks and waited for the glue to dry. I thought I removed all the nails, but we found two in the Loop line at Lismore. Also a few wagons jumped the track on a few sets of points, so some work will be undertaken to fine tune these locations before the next session - in December. However, as we now have the Fisherman Islands now basically operating, it is time to make some extra changes to the timetable to add quite a bit more operating interest. On two of my trains heading to Fisherman Islands - No. 1A and No 17, they will drop off three container wagons in Clapham Yard on the way through. To compliment this action, a Shunt train will then take them to South Brisbane Interstate Yard where some unloading/loading will occur. These wagons will be returned about 12 hours later and left on a free track at Clapham Yard and when train numbers 2 and 18 return, these wagons will be shunted onto the ends of those trains and then continue their south bound journey. Actually on the end of the opposite train that the wagons came north on. The first run around movement in a Running Session occurring at Fisherman Islands. So this weekend I completed the changes to the timetable to accomplish the above improvements. During the next week, I will desk check these timetable card movements and hopefully next weekend on Sunday I will try and do these myself movements myself in order to see that the end result plays out. I am also looking to add around 10 trains movements to the timetable that are for Narrow Gauge trains. These will run between Acacia Ridge Yard and Clapham Yard, and some will continue onto Fisherman Islands and return. Most of the ones going to Fisherman Islands will be either coal, grain or container trains. The shunts to Clapham Yard will contain louvre wagons. Now just thinking about all these movements and to ensure that I can actually cross some narrow gauge trains some where on the layout, I am thinking that I might have to add an extra narrow gauge track to Clapham Yard. Again a much future task. Sometime next year. On Friday I went down to the shed and took some video footage of the XPT running from Grafton to South Brisbane. Some of the videos are on the post before this one. On Saturday I decided I would work on three track sections that were giving me some issues. The first was the dual gauge track in Acacia Ridge Yard at the end of the blob where the tracks makes its way around a 180 degree curve and makes its way back towards Clapham Yard. I ripped up this track, and reshaped the large sweeping curve. In doing this the third rail of the dual gauge has been temporarily removed. I am currently very happy with this piece of track for standard gauge trains. I ran a container train of 80 foot wagons up and down this section and it runs very smoothly. I also ran the XPT back and forth through this section, as the XPT previously uncoupled at this location. So my attention then moved to a set of points in Clapham Yard that causes a short when they are thrown to the curve position. So I added an insulated joiner on the third rail and when I get around to adding a Peco switch under the point to switch the frog, all should be good. So the next set of points in Clapham Yard was not making electrical contact when the point was set to run into the no. 1 track in Clapham Yard. So I tinkered around with the points and it now seems to be making good electrical contact. 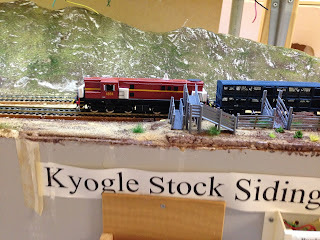 So I believe that for standard gauge trains, we can select any of the first three tracks and all the trains should have no issues with running through the yard. I then spent some time making up a structure that will eventually hang from the shed roof and provide a light source above Border Loop. This is a length of pine with four pieces of aluminium plasterer’s angle set up to form a light valance. The aluminium was painted gloss white to assist with light reflection. A string of LEDs is between the aluminium frames. So I just need to hang this from the A frames in the shed. Today I went down for a potter around. I had the football on the TV and ran a small train from Grafton Yard to Rocla Sleeper Siding and have added it back into the timetable. I then decided that I might test the headphone system for tomorrow. When I turned it on there was a massive scream in the system. After taking each plug in socket off and checking it, I found two loose wires and one dry solder joint. These were fixed, but it did not fix the scream. That was found by checking a point near the headset base station, that all the headset plug in point runs connect back to. I had a wire that had come off the last wire I soldered on. So I resoldered that wire and all is now good. I also tested each headset and ensured that they all still work. All of my Staff Systems also all work. So everything is now ready. I just need to wash up all the coffee cups. I did stock the fridge up earlier today, but mysteriously there seems to be less in it tonight than there was earlier. I have no idea what happened? So bring on tomorrow for my next running session. Also "Go the Broncos" tonight! But I can live with a Cowboys win. Thought I would show off a few scenes from The Shed. The XPT leaving Grafton Yard heading north and stopping at Rappville Loop for safe working purposes. The northbound XPT crossing over Fairy Lane and going through Fairy Hill Loop. The northbound XPT running express through Border Loop and disappearing into Border Tunnel. The XPT heading out of Border Tunnel passing over Running Creek and then into Running Creek No. 1 Tunnel. Finally the XPT passing through Dutton Park and then through Park Road Sidings and arrives into South Brisbane Interstate station. On Monday my Auscision XPT was delivered. So in order to give the coaches a run, I set them up behind a loco as I had not yet installed the decoders into the power cars. The XPT coaches kept derailing at various points on the layout. Upon closer inspection, I had to loosen the bogie screws by about a quarter turn and that fixed the issue. After dinner that night, I installed the TCS EU621 decoders into the power cars. I put them on the track set the first power car to forward hit the headlight button and incremented the speed and it ran in reverse with the red marker lights lit. So I put the loco into reverse and it ran forward with the white headlights lit. Function 1 turns on the flashing strobes on the roof. The second power car behaved similarly. Well tonight I got down to the shed and set up CV22 in each loco. This controls how certain functions (F0F and F0R - front headlight and rear lights) are handled while the locos are in a consist. But setting this to a value of 3 the headlights and red marker lights will work in a consist. So I made a consist of my two locos. The power cars were numbered 2012 and 2017. Now I use the NCE DCC system and it is simply the best out there in my opinion. Now remembering that the locos run in reverse direction to the way they should, I made up an advanced consist with 2012 as the front power car and said it was running in reverse. I then added the rear power car as 2017 and said it was running in forward direction. We know that this was not correct but if you do, the power cars behave correctly. When you select 2012, and hit forward and turn the headlights on, the white headlights in 2012 come on and the red marker lights in 2017 come on. If I hit reverse, the lights change around correctly. 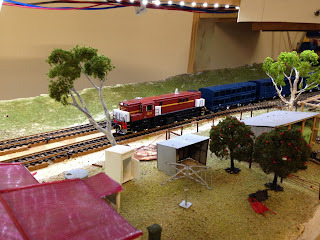 However, if you were to drive your XPT back the other way for any extended distance, I believe that you should select the other power car as the loco to drive and select its headlight. But either way, the lights still work correctly. So this is how to solve the issue with the incorrectly wired headlights in the Auscision XPT. Quite simply really.